TT Compotes is an handmede typeface created by Ivan Gladkikh and published by TypeType which is available in 10 fonts, emotional & ingenous character style, every letter is alive, every style is unique for all occasions. 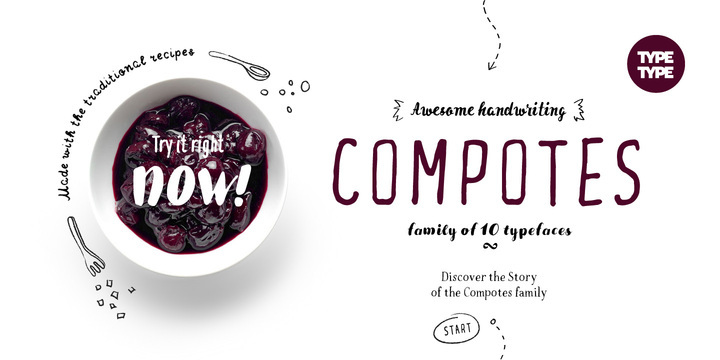 Try them all in search of the best combinations, mix them to achive the best result in typography design. It is ideal for logo, packaging, magazine etc. Price: starting from $25,00 for one font to $200,00 for all 10 fonts. A font description published on Saturday, November 21st, 2015 in Fonts, Ivan Gladkikh, TypeType by Alexandra that has 3,556 views.